Back in college GARETH HINDS sketched legendary scenes from Yoshitsune’s life—just for fun. Today he is the creator of highly acclaimed graphic-novel adaptions of Macbeth, Romeo and Juliet, The Odyssey, Beowulf, and other classics (Candlewick). Gareth lives in Washington D.C.
*With more beheadings than you can shake a katana at, this account of the life of twelfth-century samurai Minamoto Yoshitsune is pure excitement. While he is known mostly through legends, Turner plumbs the archives to figure out who Yoshitsune—the man who redefined the samurai—really was. Beginning in 1160, her account describes the clan rivalry between the Minamotos and the Taira, particularly Yoshitsune's father's failed power grab, which lost him his head and tipped the scales to favor the Taira. Yoshitsune was sent to a Buddhist monastery, but as a teenager, he snuck away to pursue a warrior's life and seek revenge. Throughout, Turner uses modern language and points of reference to draw meaningful comparisons to historic events. For instance, she likens Yoshitsune's sudden decision to undergo samurai training to that of a "boy who never had played Little League showing up for spring training with the Yankees." 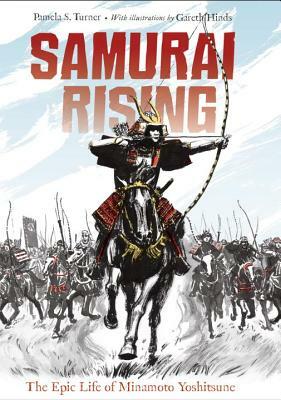 In short, fast-moving chapters—each with opening art by Hinds—readers witness the rebellious, brave Yoshitsune's formative battles, rise to fame, and eventual fall in 1189, while gaining an understanding of the changing role of samurai in Japanese society. Every bit as exciting as fiction, Yoshitsune's saga is supported with extensive chapter notes, a time line, a character list, and an explanation of how Turner recreated his world. Kids who think history is boring will lose their heads over this one. *The life of 12th-century samurai Minamoto Yoshitsune unfolds in this compelling and often shocking nonfiction account. *Minamoto no Yoshitsune, the 12th-century Heian hero who defeated the rival Taira clan only to be undone by another member of the Minamoto group, is a samurai legend. His rise from obscurity, reckless brilliance in battle, and gruesome end (which helped establish seppuku as part of the warrior code) are irresistible features of a life that ended at age 30. A near-contemporary chronicle, Heike monogatari, and a nemesis’s history, Azuma kagami, reporting Yoshitsune’s deeds were too thin for the popular imagination, which immediately began embroidering on the sources. Turner unpicks some of the yarn but brightens the colors of what remains so that Yoshitsune, physically a small man, leaps from the pages, larger than life and twice as active. Everyone dies—violently—but the famous ends of Atsumori, Antoku, Kiyomori, and others are moving rather than grim. The text rips along, skillfully engaging teens in many swift turns of events. Historical and cultural references are impressively accurate, and Hinds’s fluid brush-and-ink drawings and battle maps add useful detail. Although Turner often uses the word probably, the compelling narrative never strains credulity, and expert tricks help readers navigate Japanese names and sort out relationships. Students will find the 60 pages of endnotes equally fascinating and lively; a seven-page bibliography attests to the serious research behind the vivid (but never simplistic) writing. VERDICT Japanophiles, action lovers, and future historians will all find this book gripping.